If you or a loved one is ready to downsize and make a transition to an apartment, condo, or assisted living facility, count on the dedicated New Jersey senior movers at SeaCure to handle your relocation with care and respect. SeaCure Moving, Inc. has been a premier senior mover since 1981. We can help you declutter, transfer and store household goods of all sizes and requirements. 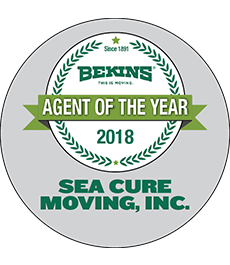 For over 30 years of quality service and a long string of satisfied customers, SeaCure has become a BBB-accredited business and a ProMover with the American Moving & Storage Association (AMSA). Our services can be tailored to you or your loved one’s precise needs. Oftentimes during senior moves decluttering to move to a smaller space is necessary. Our professionals can help you dispose of or donate unneeded items according to your wishes, or store what you do want to keep in our secure 25,000 square foot facility. If you need to sell your home, New Jersey senior relocation is simplified by our home staging and interior decorator receiving services. SeaCure’s expert full-service packing and custom crating will further ease your journey. Don’t delay any longer – the premier New Jersey senior movers at SeaCure are here to serve. Call today to speak with a friendly representative about your requirements, or fill out our Quick Quote Form now to receive a free estimate!